First Line: There have been two moments in my life when everything changed. Little did Madeleine Maxwell know, but when she was employed by St. Mary's Institute of Historical Research, she'd just found the perfect job. "Max" becomes a part of St. Mary's historical research team. They don't do "time travel," they "investigate major historical events in contemporary time." The historians of St. Mary's observe and document in order to find the answers to many of history's unanswered questions. 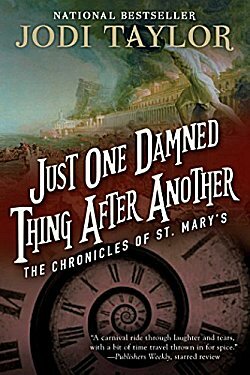 But in this first Chronicle of St. Mary's, Max and the others discover that it's not just history they're fighting. I was in the perfect mood for this book. I've always enjoyed a good time travel tale, and when Max started walking through the venerable halls of St. Mary's and seeing signs labeled "Blast Doors" and "To Sick Bay," I knew I was going to have fun. And this is the major purpose of Jodi Taylor's book-- to have fun. Time is important in our organization. If you can't even get to an appointment in your own building on time, they argue, you're not going to have much luck trying to find the Battle of Hastings. If you're in the mood for something with an intriguing premise and an entertaining mystery, something that's light and loads of fun, you may just enjoy this first Chronicles of St. Mary's book as much as I did. It won't take me long to sample another! This sounds fun. And I've never heard of it. Will check it out. How nice that there are other books in the series for you to sample. I hadn't heard of it either, Kay. It happened to come up on one of my daily eBook emails. Hmm.....I usually go for more plausibility, Cathy. But this does sound interesting. And sometimes, a fun read is just what the doctor ordered! It certainly was what I needed, Margot!